The gods smiled on us. After some rainshowers the first 2 days in Dumaguete, the bright sun and clear skies looked promising as we sailed from Bais wharf towards that area straddling between Cebu and Negros. Our boat — good for 15 pax — served all 4 of us well. 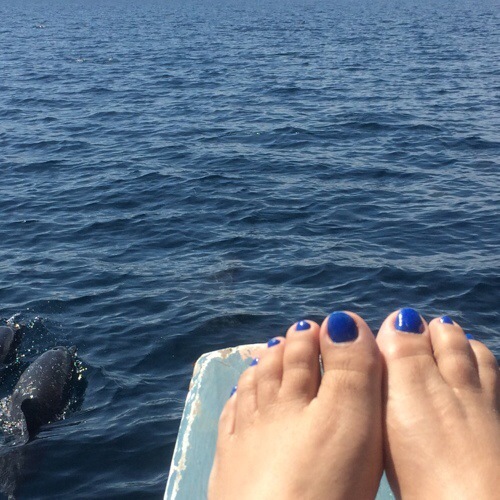 We loved the “space”, allowing us to run up front, to the left or right sides of the boat, even to lie down on the long benches while the boat crew navigate along the Strait searching for pods of playful dolphins. 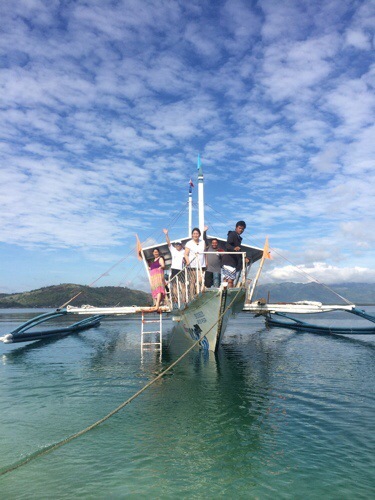 Our boat sailed out of Bais Wharf, an hour’s drive north of Dumaguete City. 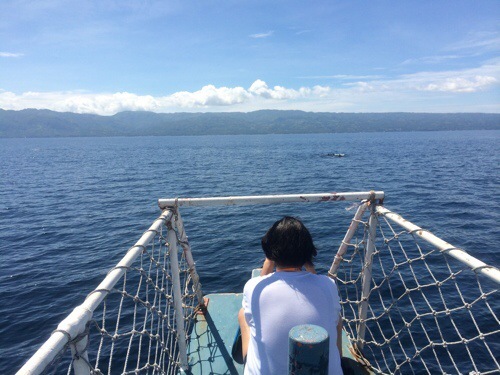 If you’re lucky, you’d see dolphins near Manjuyod Sandbar just 10-15 minutes from the wharf. 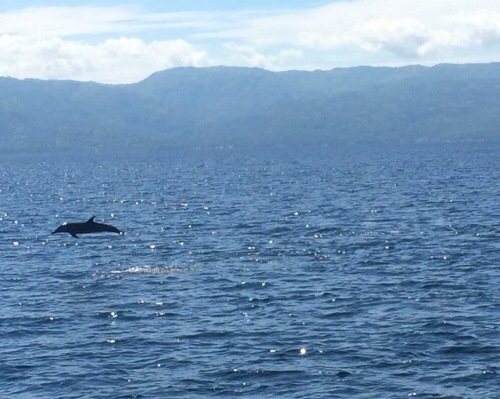 The deep blue waters of Bais Bay and Tañon Strait is home to these intelligent mammals. 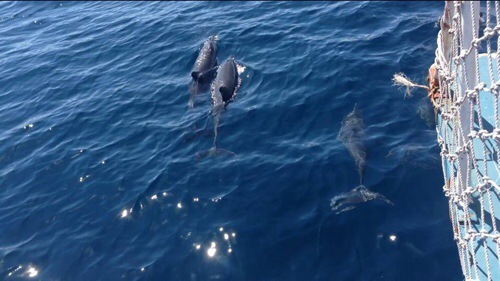 I shrieked in delight as soon as I spotted some spinner dolphins playfully showing off from a distance. 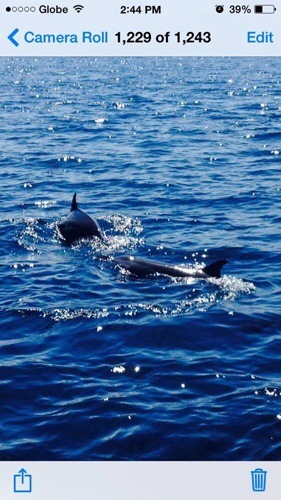 And these dolphins looked just as happy seeing us and swimming alongside our boat. Like children showing off their talents. Or like marine escorts leading us to more of their friends! Playful, Intelligent Mammals in their very playground! None of us were fast enough to take a decent shot of those dolphins jumping up and out of the water. But it was still an awesome (pardon the overused word) animal adventure for us. 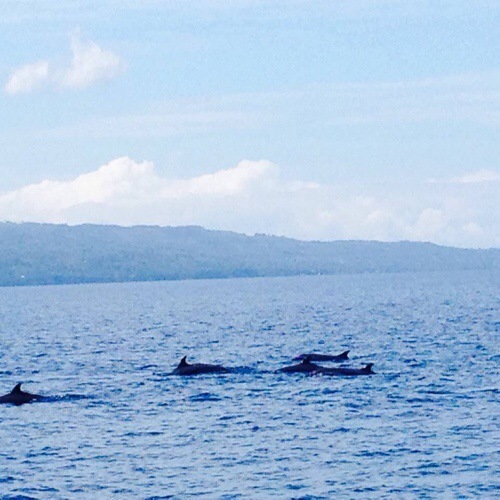 Mimicking dolphin sounds, we enjoyed schools of them in the calm waters of the bay and further along Tañon Strait. Surely, this is their playground! Swimming alongside of our boat, like marine escorts! The strait spans 5 kilometers to as wide as 27 kilometers between Negros Oriental and Cebu provinces. 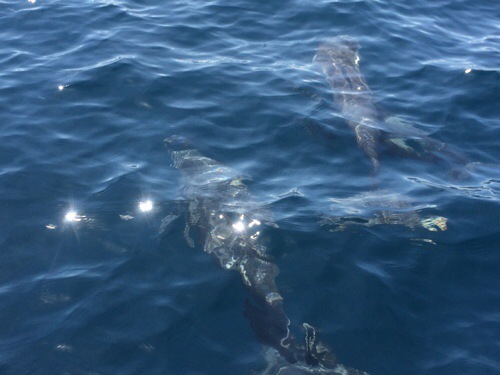 But it was in the deep, wide sections of the Strait where we found more dolphins. No luck with the pygmy sperm whales, but the many show-off dolphins made up for the whales’ absence. What a thrill! Glistening in the blue waters of Tañon Strait. Up front, left and right of the boat. They’re everywhere! 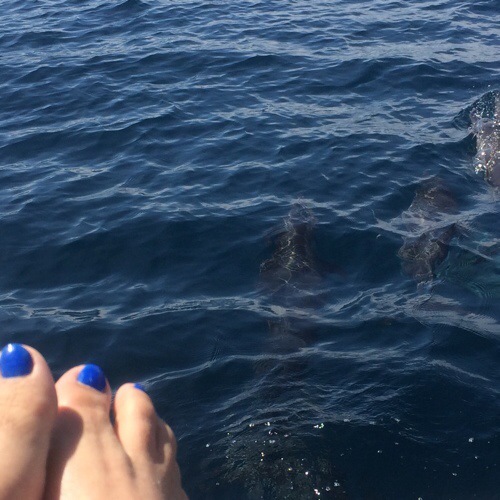 Travel Tips: Go early and catch them dolphins during their feeding time. From Dumaguete, we drove less than an hour to Bais and took a boat. If the tide’s low, best to stop by Manjuyod Sandbar just 10-15 minutes boat ride from the wharf. If you’re lucky, you can already spot some dolphins here. Further on, you’d be literally surrounded by these far-from-shy creatures. As happy as can be. Them and you. Surely, Negros is so blessed with nature’s bounty! Dolphins in the wilds. Far from shy.